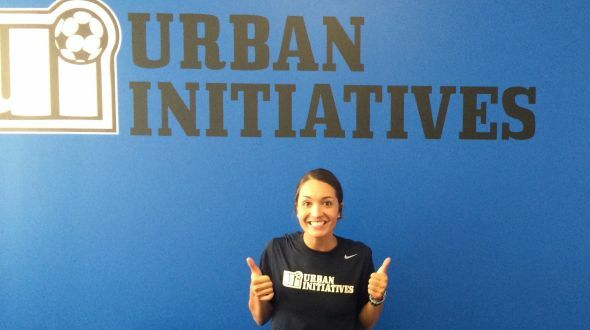 Urban Initiatives – PArty Time: Meet Kaitlyn! Frank: Where did you grow up? Originally from? Kaitlyn: I was born and raised in the very cold land of Wasilla, Alaska! Frank: Where did you go to school? What did you study? Kaitlyn: I attended Central Methodist University, which is located in Fayette, Missouri. I double majored in Communications and Sociology and minored in English. Kaitlyn: I’m huge believer and proponent of Sports Based Youth Development models and organizations and feels that the UI Mission statement resonates with me and my personal involvement with sports. I love kids and can’t wait to be in the schools and be involved with the communities! Frank: What sports did you play growing up? Today? Kaitlyn: I enjoyed playing any sport was in-season while growing up. I still plays basketball recreationally when I find the time. Frank: Do you have any fun hobbies? Talent? Kaitlyn: I love to hike, backpack, and camp. Frank: What are you favorite snacks? Frank: What are you most excited for in your new role? Kaitlyn: I’m really excited to build relationships with the students and teachers, as well as my co-workers and others throughout the UI organization. Networking and learning about the non-profit sector are also things that excite me. Frank: Who is your favorite pro-athlete and why? Kaitlyn: Ronda Rousey because she is a fearless athlete! Previous Article: PArty Time: Meet Alexandra!